Summon: Draw an item of your choice from your deck. Crucible Blacksmith is a common Intelligence creature card. It is part of the Isle of Madness story set. "Name it, I'll forge it." "Time to test my metal." 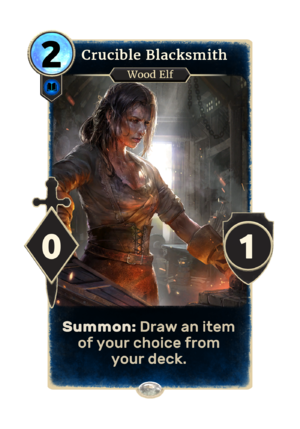 This card seemingly depicts Cutter, a Wood Elf blacksmith who previously appeared in the Shivering Isles expansion for Oblivion. This page was last modified on 25 March 2019, at 11:46.